Even with it's large clubface, the driver is difficult to hit. The driver is one of the most difficult clubs to hit in golf. This is because the club is longer than the other clubs, and it has a lower loft angle. 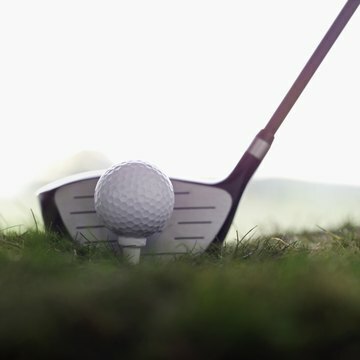 If you are a beginning golfer, make sure your driver has a flexible shaft, a large clubface with a large sweet spot and a loft of at least 10.5 degrees. In order to hit the driver correctly and get the distance and accuracy you are looking for, go through a mental checklist during your pre-shot routine. Survey the fairway to determine the target line and avoid hazards such as bunkers and water. Grip the club properly, and align the clubface and your body to the target line. It can help to have an intermediary target such as a leaf a couple of feet from the ball along the target line. Stand with your feet shoulder distance apart, and position the ball even with the inside of your front foot. Bend your knees slightly, and allow your arms to hang down from your shoulder sockets in a relaxed position. Think about where the ball will land, and visualize the shot. If you feel you need more control over the club, choke down on the grip of the club a little bit. Start the backswing by keeping the clubhead low to the ground and sweeping the club back. Your shoulders will turn around your spine, and your weight will shift toward the back foot. The front shoulder will move under your chin and approach the back armpit. As you take the club back, the toe of the clubface will face up toward the sky. When your arms and the club are parallel to the ground, your wrists will be cocked to 90 degrees. At the top of your backswing, your body will be in a coiled position with the clubhead ready for a powerful downswing. Move your forward knee toward the target line to begin the downswing. Your weight will begin to shift from the back foot to the front foot. Rotate your hips quickly toward the target to generate a powerful swing with more distance. Your wrists will remain cocked at 90 degrees with your thumb pointing up until you make contact with the ball. Make contact with the ball with your arms stretched out, and try to feel the weight of the clubhead as it hits through the ball. Finish the drive with a strong follow-through, your back heel will be up and your back toe will be pointed at the ground. As you execute the drive, try to have your arms, shoulders and torso work together for a smooth, coordinated swing. Keep your balance and posture through the tee shot without swaying from side to side.